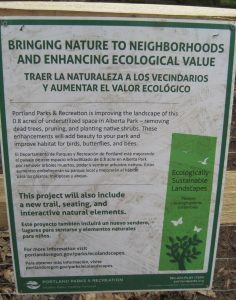 Taking a walk through my NE Portland neighborhood recently, I came across something new in our local park. 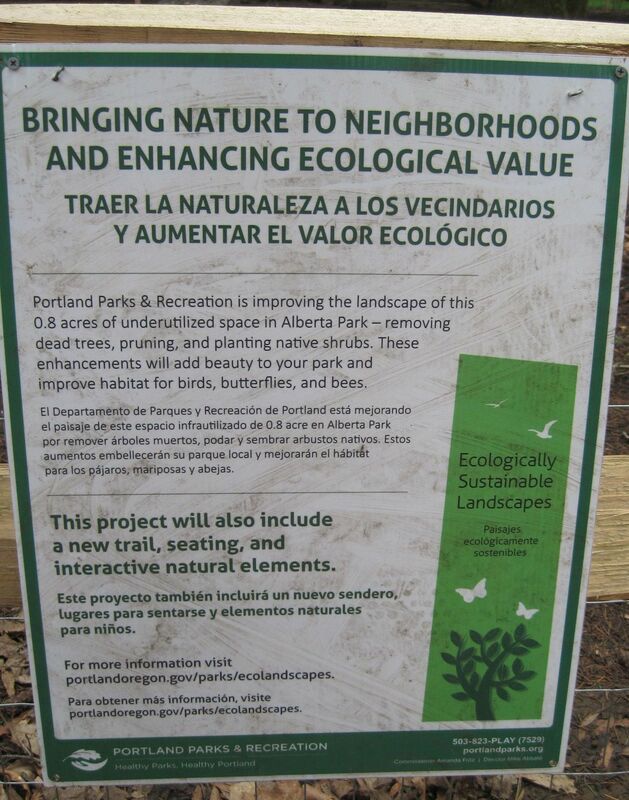 Portland Parks and Recreation is renovating an underutilized section of Alberta Park as a “Nature Patch”. Alberta Park was part of a Homestead Act land claim over 150 years ago, and became a park in 1917. (Check out a local historian’s writeup for the details.) So over 150 years of human use, the land is far from the forest that once grew there. The Nature Patch could be thought of as a re-engineering project. Alberta Park in 1929 and 2018. If you look closely, you’ll see the lamp posts are still there. 1929 Photo courtesy City of Portland archives. 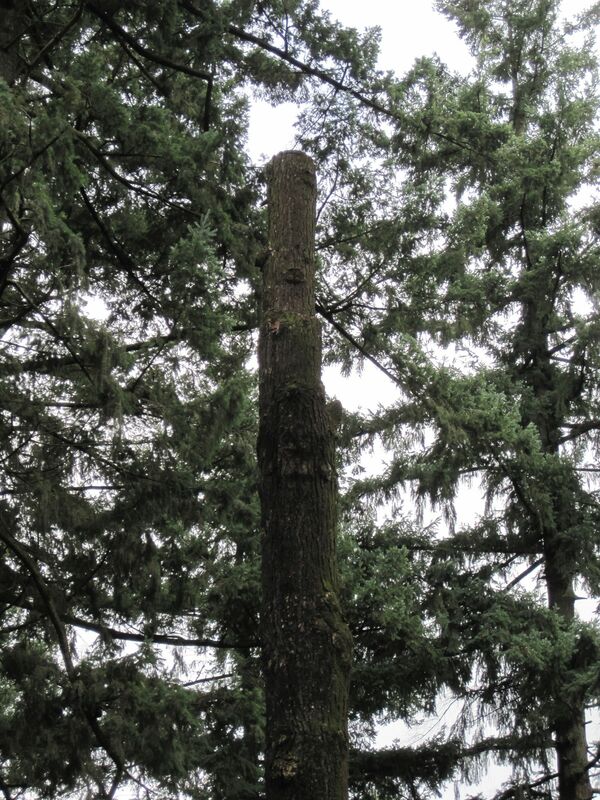 Like many of Portland’s parks, Alberta Park is dominated by towering Douglas-fir trees which cast shade on the playgrounds, lawns, off-leash areas, and other park amenities. But walking on the new gravel path through the one-acre Nature Patch, I saw how elements of a functioning, diverse forest are being reintroduced. Dead trees have been felled and left in place as downed wood, or cut to a safe height to remain as a snag. 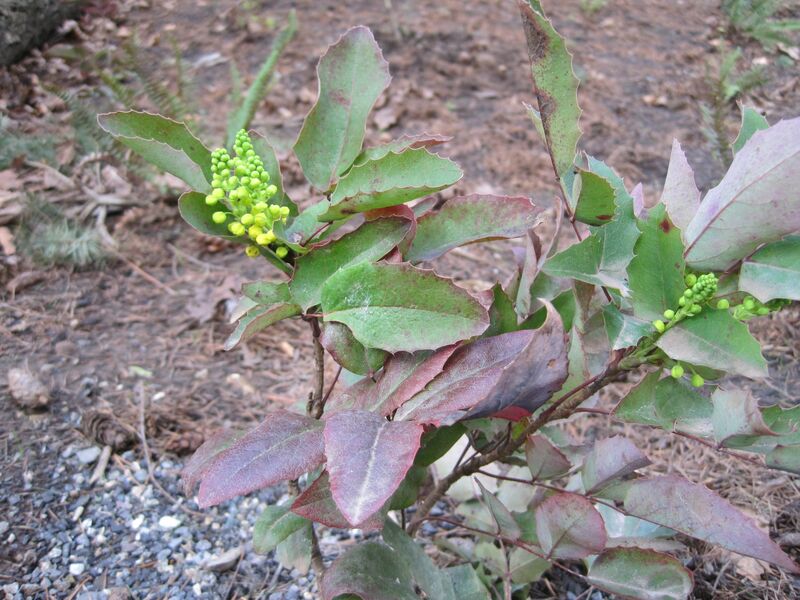 Understory planting is in progress, with pollinator-friendly plants like Oregon-grape, ninebark, and snowberry, as well as ferns and even herbaceous forest plants like oxalis. When the understory fills in, I think it will be quite lovely and a vast improvement over the muddy, sparse grass that had a hard time growing under the Douglas-firs’ shade. A dead or declining tree was turned into a snag, safely away from the pedestrian path. Oregon-grape is one of the earliest blooming woodland plants. It needs some sun to produce flowers. Why am I writing about an urban park on a blog for small woodland owners? Well, I think there are some parallel lessons that woodland owners can draw from the Alberta Nature Patch. The designers did an excellent job of working with their existing urban forest landscape to introduce structural and biological diversity. Indeed, many of the elements we wrote about in previous blog posts are on display here: snags, downed woody debris, and understory shrubs and forbs. It also demonstrates a concept we discussed in a previous case study: that not all acres of your woodland (or park) need to serve all of your management objectives at the same time. You can compartmentalize if you need to. An off-leash area, a playground, and a ball field – all areas that are critical to the recreation mission of the site – border the Nature Patch at Alberta Park. You can have some areas that you manage more intensively for timber, and others, maybe those that are inherently less productive, for habitat. This project illustrates that no area is too small or too urban for wildlife to benefit. Particularly, pollinators such as bees, who need our help. We’re still learning about how bees and other pollinators use forests. But they frequent open, sunny areas where flowering plants flourish. These might be along your roadsides, forest edges, or in a recently logged area. A new publication from OFRI outlines some steps woodland owners can take to make forests pollinator-friendly. Perhaps the greatest value of the Nature Patch lies in public exposure. Living on a small woodland, it can be easy to forget that many people in cities, especially those who don’t have a car, don’t have easy access to nature. For some people who have always lived in an urban environment, forests might even feel unfamiliar or intimidating. Bringing a bit of native forest to the city park exposes park users to a setting that woodland owners take for granted. I like to think that exposure gives way to appreciation. We in the forest sector need ALL Oregonians to appreciate forests. Like Alberta Park, the land that many small woodland owners care for often has seen many previous uses. If your woodland was once a farm, pasture, or even an industrially managed forest, many elements of a native forest are missing. Reintroducing diversity to a forest requires intention. But if it can be done in an urban park, surely it can be done on a small woodland. Where is the “Nature Patch” on your place?